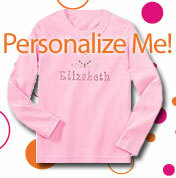 Bling Your Personalized Baby Clothes! Can you blame us when we say that kid love these personalized baby clothes? What kid wouldn’t love to have a tee that has their own name strewn across in rhinestones? Everyone will see them coming in these bling tops that they will put on and, never want to take off! These will make great gifts for the birthday girl or boy or shower gift for the new arrival! The newest ideas of gift givings just got better with adorned gifts for everyone on your gift list at Smarttepantsclothing.com!